Vicki Varvaressos belongs to a significant generation of artists who addressed women's issues in their work during the 1970s and early 80s. In her paintings from this period, such as 'Allure: What is it - Who’s got it' 1985, Varvaressos drew attention to how women were often misrepresented in the media by satirising their portrayal in glossy lifestyle magazines. From the mid-1980s, Varvaressos abandoned social commentary in her work for more traditional and introspective genres such as portraits and still-lifes. 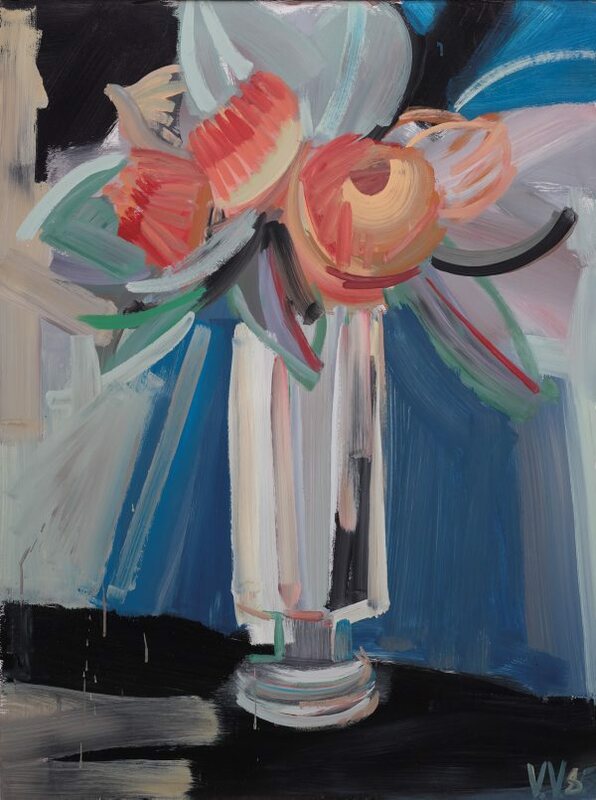 In 'Still Life: West Australian gum blossoms' 1985, Varvaressos pays homage to fellow pioneering woman painter in Australian art: Margaret Preston. This painting has its origin in an exhibition organised by the education department at the AGNSW in 1985 where contemporary artists were invited to create a work in response to Preston's 'Western Australian gum blossom' 1928. Signed and dated l.r. corner, blue/green synthetic polymer paint "VV 85". Signed and dated upper c. verso on hardboard, white synthetic polymer paint "VICKI VARVARESSOS/ 1985".